By Terry has been one of my favorite brands for years now (see previous reviews here). It gets attention but I like that is not too overly saturated in the marketplace. Both the makeup and skincare are remarkable (this toner is amazing at hydration and this foundation is great at keeping my skin perfect and matte all day long), and these Ombre Blackstar shadow sticks are one of the most well known products from the line - and for good reason! There are a ton of shades in this formulation, but I have 4 that are my favorite and will work well for neutral lovers. But for those that want more vibrant color options, there is something for everyone. The ones I have here are all shimmer, but there are matte shades that would work beautifully as a base eyeshadow or even an eye liner. Bronze Moon was the first shade I ever used from the Ombre Blackstars, which is the most perfect golden bronze. The texture is smooth, creamy, blends seamlessly but sets after a minute and stays put for most of the day. It isn't the most creaseproof and smudgeproof formula I have ever tried, but I enjoy that I don't have to work that hard to remove it at night. I don't find that it creases on me unless I am in very hot weather. I am drawn to these because the shimmer is richer than other brands I've tried and they make the lid look smooth and even. Blond Opal is gorgeous as a base shadow, inner corner highlight or even as a subtle fresh eye look. I pair it with heavy mascara as a contrast and love the effect. 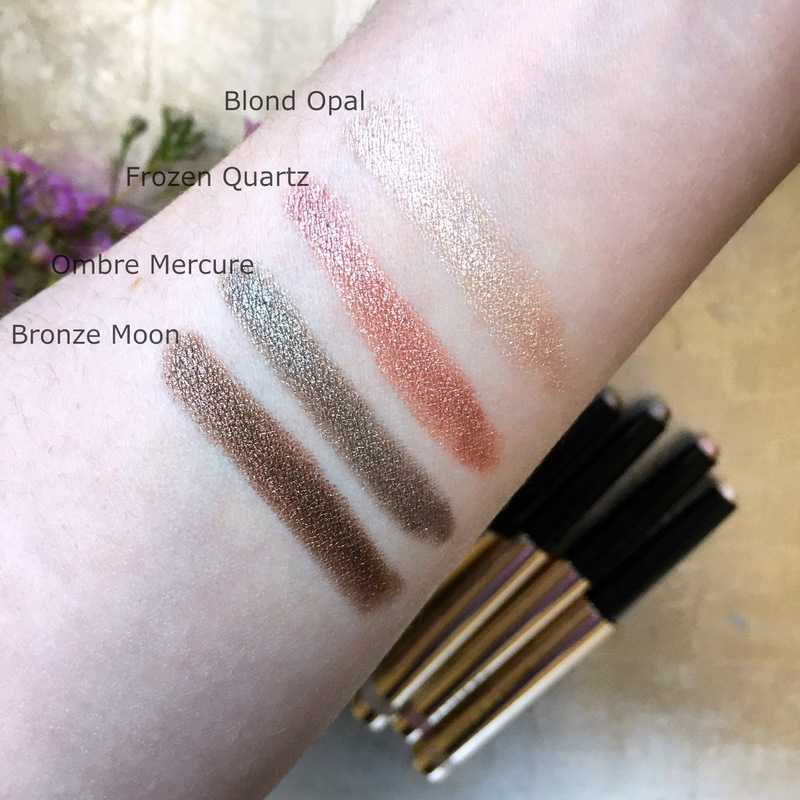 Ombre Mercure is not as dark as Bronze Moon and is the one I tend to wear the most. It gives my eyes some definition but is still appropriate for day. And since it is more cool toned, I like pairing it with a warm cheek and peachy lip to complement it. Frozen Quartz can look a bit red in the above swatch, but when on the lid it reads as more of a peachy bronze. This is the quintessential summer shadow stick and I envision those who tan well will love this color. Even though I stay pale as a ghost year round, I still enjoy the copper effect it gives my lids. For those that are shadow stick aficionados, this formulation is one that is worth adding to the collection. Between the shimmer, shade range and creamy texture, they are a splurge-worthy item. The Ombre Blackstars are beyond amazing! Ombre Mercure is my favorite! 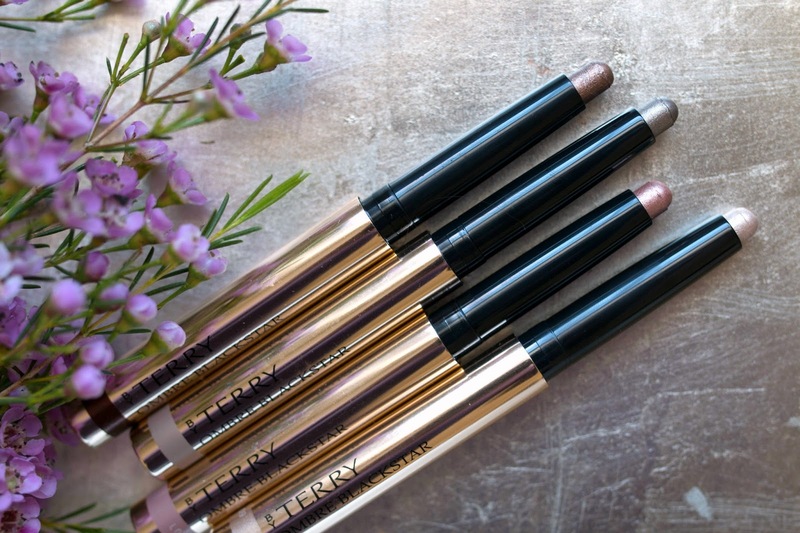 I love shadow sticks, and By Terry one is the best. Also love Mally's shadow stick! I love these I'm surprised you don't have misty rock it's the most beautiful shade along with the ones you have here. OMG I love the misty rock so much.I always pair it with the frozen quartz and it is GORGEOUS!! !